Austria-Hungary. Count Szápáry, Austro-Hungarian Ambassador at St. Petersburg, telegraphed Count Berchtold, Minister for Foreign Affairs at Vienna, of a conversation he had just had with M. Sazonof. Mistaken impressions, he told the Russian Minister for Foreign Affairs, were abroad in Russia as to Austria-Hungary's intentions. "We were credited with wishing to push forward into Balkan territory, and to begin a march to Salonica or even to Constantinople. Others, again, went so far as to describe our action merely as the starting point of a preventive war against Russia. I said that all this was erroneous, and that parts of it were absolutely unreasonable. The goal of our action was self-preservation and self-defense against hostile propaganda by word, in writing, and in action, which threatened our integrity. It would occur to no one in Austria-Hungary to threaten Russian interests, or indeed to pick a quarrel with Russia. And yet we were absolutely determined to reach the goal which we had set before us, and the path which we had chosen seemed to us the most suitable. As, however, the action under discussion was action in self-defense, I could not conceal from him that we could not allow ourselves to be diverted from it by any consequences, of whatever kind they might be. "M. Sazonof agreed with me. Our goal, as I had described it to him, was an entirely legitimate one, but he considered that the path which we were pursuing with a view to attaining it was not the surest. He said that the note which we had delivered was not happy in its form. He had since been studying it, and if I had time, he would like to look it through once more with me. I remarked that I was at his service, but was not authorized either to discuss the text of the note with him or to interpret it. Of course, however, his remarks were of interest. 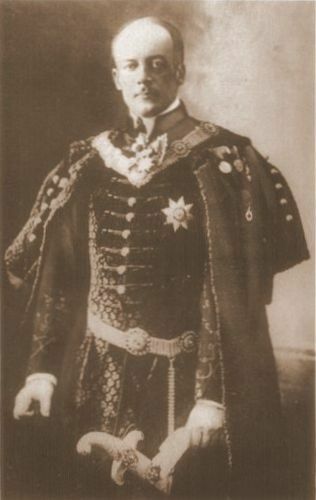 The minister then took all the points of the note in order, and on this occasion found seven of the ten points admissible without very great difficulty; only the two points dealing with the collaboration of the Imperial and Royal officials in Serbia and the point dealing with the removal of officers and civil servants to be designated by us, seemed to him to be unacceptable in their present form. With regard, to the first two points, I was in a position to give an authentic interpretation in the sense of your excellency's telegram of the 25th instant; with regard to the third, I expressed the opinion that it was a necessary demand. Moreover, matters had already been set in motion. The Serbians had mobilized on the previous day, and I did not know what had happened since then." Count Berchtold instructed Count Szápáry by telegraph to declare to M. Sazonof that, so long as the war between Austria-Hungary and Serbia remained localized, the [Dual] Monarchy did not aim in any way at territorial acquisitions of any sort. Count Szögyény, Ambassador at Berlin, telegraphed to Count Berchtold that M. Sazonof had explained to Count Pourtalès, the German Ambassador at St. Petersburg, that he could not guarantee that Russia had not begun mobilization, and confessed that certain necessary military measures were being taken. "Major von Eggeling, German Military Attaché at St. Petersburg, reports that the Russian Minister for War, M. Suchomlinof, has given him his word of honor that not a man or a horse has been mobilized; however, naturally, certain military precautions have been taken; precautions which, as the German military attaché adds ... 'are to be sure pretty far-reaching.'" Count Berchtold informed the Austro-Hungarian Ambassadors at Berlin, Rome, London, Paris, and St. Petersburg of the annotations of his Government to the Serbian reply. Germany. The Austro-Hungarian Consulate at Kovno, Russia, telegraphed to the German Chancellor, Dr. von Bethmann-Hollweg, that Kovno had been declared to be in a state of war. The German Minister at Berne, Switzerland, telegraphed to the Chancellor that the French Fourteenth Corps had discontinued maneuvers. "The Secretary of War [Suchomlinof] has given me his word of honor that no order to mobilize has as yet been issued. Though general preparations are being made, no reserves were called and no horses mustered. If Austria crossed the Serbian frontier, such military districts as are directed toward Austria, viz Kiev, Odessa, Moscow, Kazan, are to be mobilized. Under no circumstances those on the German frontier, Warsaw, Vilni, St. Petersburg. Peace with Germany was desired very much. Upon my inquiry into the object of mobilization against Austria he shrugged his shoulders and referred to the diplomats. I told the secretary that we appreciated the friendly intentions, but considered mobilization even against Austria as very menacing." 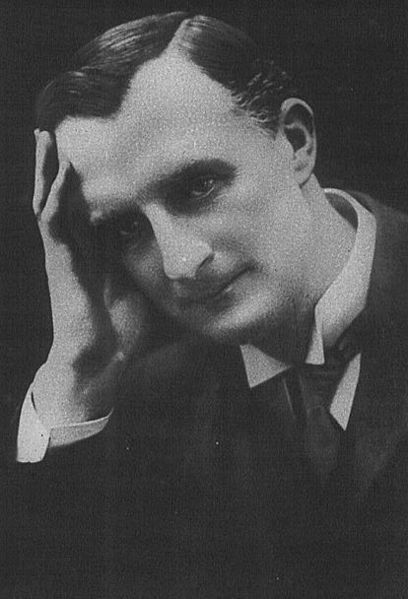 "We know as yet nothing of a suggestion of Sir Edward Grey's to hold a quadruple conference in London. It is impossible for us to place our ally in his dispute with Serbia before a European tribunal. Our mediation must be limited to the danger of an Austro-Russian conflict." "We have at once started the mediation proposal in Vienna in the sense as desired by Sir Edward Grey. We have communicated besides to Count Berchtold the desire of M. Sazonof for a direct parley with Vienna." Russia. 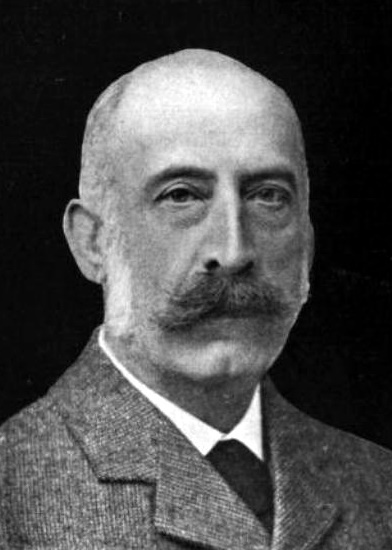 Count Benckendorff, Russian Ambassador at London, telegraphed to M. Sazonof, Minister for Foreign Affairs at St. Petersburg, to know if his views on direct discussions with the Vienna Cabinet harmonized with Grey's scheme for mediation by the four powers, Great Britain, France, Italy, and Germany. "Having heard from the British Ambassador at St. Petersburg that you would be prepared to accept such a combination, Grey decided to turn it into an official proposal, which he communicated yesterday to Berlin, Paris, and Rome." M. Sazonof replied by telegraph that the British Ambassador at St. Petersburg, Sir George Buchanan, had asked him if the Russian Government thought it desirable for Great Britain to take the initiative in convoking a conference in London of the four powers. "I replied that I have begun conversations with the Austro-Hungarian Ambassador under conditions which, I hope, may be favorable. I have not, however, received as yet any reply to the proposal made by me for revising the note between the two Cabinets. "If direct explanations with the Vienna Cabinet were to prove impossible, I am ready to accept the British proposal, or any other proposal of a kind that would bring about a favorable solution of the conflict. "I wish, however, to put an end from this day forth to a misunderstanding which might arise from the answer given by the French Minister of Justice to the German Ambassador, regarding counsels of moderation to be given to the Imperial [Russian] Cabinet." This telegram Benckendorff communicated to Grey on the following day. M. Sazonof telegraphed to the Russian Ambassadors at Paris, London, Berlin, Vienna, and Rome that the Serbian reply exceeded expectations in its moderation and desire to afford the fullest satisfaction. "We do not see what further demands could be made by Austria, unless the Vienna Cabinet is seeking for a pretext for war with Serbia." "1. That Austria has declared to Russia that she seeks no territorial acquisitions and that she harbors no designs against the integrity of Serbia. Her sole object is to secure her own peace and quiet. "2. That consequently it rests with Russia to avoid war. "3. That Germany and France, entirely at one in their ardent desire to preserve peace, should exercise their moderating influence upon Russia. "Baron von Schoen laid special emphasis on the expression of solidarity of Germany and France. The Minister of Justice is convinced that these steps on the part of Germany are taken with the evident object of alienating Russia and France, of inducing the French Government to make representations at St. Petersburg, and of thus compromising our ally in our eyes; and finally, in the event of war, of throwing the responsibility not on Germany, who is ostensibly making every effort to maintain peace, but on Russia and France." In a supplementary telegram M. Isvolsky stated that the telegram from Belgrade to Paris, giving the Serbian reply to the Austrian note was delayed twenty hours, and that the telegram from the French Foreign Office containing instructions to support Russia's representations, which had been sent at the special urgent rate at 11 a. m., July 25, 1914, only reached its destination at 6 p. m.
"There is no doubt that this telegram was intentionally delayed by the Austrian telegraph office." "The Austrian Ambassador [Count Szécsen] has informed the Acting Minister for Foreign Affairs [M. Bienvenu-Martin] that to-morrow, Tuesday, Austria will proceed to take 'energetic action' with the object of forcing Serbia to give the necessary guaranties. The minister having asked what form such action would take, the ambassador replied that he had no exact information on the subject, but it might mean either the crossing of the Serbian frontier, or an ultimatum, or even a declaration of war." "I begged the Minister for Foreign Affairs [Von Jagow] to support your proposal in Vienna that Szápáry [Austro-Hungarian Ambassador at St. Petersburg] should be authorized to draw up, by means of a private exchange of views with you, a wording of the Austro-Hungarian demands which would be acceptable to both parties. Jagow answered that he was aware of this proposal and that he agreed with Pourtalès [German Ambassador at St. Petersburg] that, as Szápáry had begun this conversation, he might as well go on with it. He will telegraph in this sense to the German Ambassador at Vienna. I begged him to press Vienna with greater insistence to adopt this conciliatory line; Jagow answered that he could not advise Austria to give way." "Cambon endeavored to induce Von Jagow to accept the British proposal for action in favor of peace to be taken simultaneously at St. Petersburg and at Vienna by Great Britain, Germany, Italy, and France. Cambon suggested that these powers should give their advice to Vienna in the following terms: 'To abstain from all action which might aggravate the existing situation.' By adopting this vague formula, all mention of the necessity of refraining from invading Serbia might be avoided. Jagow refused point blank to accept this suggestion in spite of the entreaties of the ambassador, who emphasized, as a good feature of the suggestion, the mixed grouping of the powers, thanks to which the opposition between the Alliance and the Entente—a matter of which Jagow himself had often complained—was avoided." 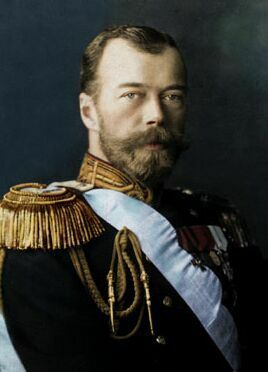 Nicholas II telegraphed his reply to the appeal for Russian aid made by Prince Alexander of Serbia on July 25, 1914. It assured the prince of the Czar's cordial sympathy with the Serbian people. "The existing situation is engaging my most serious attention, and my government are using their utmost endeavor to smooth away the present difficulties. I have no doubt that your highness and the Royal Serbian Government wish to render that task easy by neglecting no step which might lead to a settlement, and thus both prevent the horrors of a new war and safeguard the dignity of Serbia. "So long as the slightest hope exists of avoiding bloodshed, all our efforts must be directed to that end; but if in spite of our earnest wish we are not successful, your highness may rest assured that Russia will in no case disinterest herself in the fate of Serbia." M. Schebeko, Russian Ambassador at Vienna, telegraphed to M. Sazonof of a conversation he had had in the absence of Count Berchtold, Minister for Foreign Affairs, with Baron Macchio, the Under-Secretary. "I drew his attention to the unfavorable impression produced in Russia by the presentation of demands by Austria to Serbia, which it was quite impossible for any independent state, however small, to accept. I added that this method of procedure might lead to the most undesirable complications, and that it had aroused profound surprise and general condemnation in Russia. We can only suppose that Austria, influenced by the assurances given by the German representative at Vienna, who has egged her on throughout this crisis, has counted on the probable localization of the dispute with Serbia, and on the possibility of inflicting with impunity a serious blow upon that country. The declaration by the Russian Government that Russia could not possibly remain indifferent in the face of such conduct has caused a great sensation here." "Grey has just informed the German Ambassador, who came to question him as to the possibility of taking action at St. Petersburg, that such action ought rather to be taken at Vienna, and that the Berlin Cabinet were the best qualified to do so. Grey also pointed out that the Serbian reply to the Austrian note had exceeded anything that could have been expected in moderation and in its spirit of conciliation. Grey added that he had therefore come to the conclusion that Russia must have advised Belgrade to return a moderate reply, and that he thought the Serbian reply could form the basis of a peaceful and acceptable solution of the question. "In these circumstances, continued Grey, if Austria were to begin hostilities in spite of that reply, she would prove her intention of crushing Serbia. Looked at in this light, the question might give rise to a situation which might lead to a war in which all the powers would be involved. "Grey finally declared that the British Government were sincerely anxious to act with the German Government as long as the preservation of peace was in question; but, in the contrary event, Great Britain reserved to herself full liberty of action." Great Britain. Sir Maurice de Bunsen, Ambassador at Vienna, telegraphed to Sir Edward Grey, Secretary for Foreign Affairs at London, that he had consulted with his colleagues about the mediation of the four powers, and the impression was that the note to Serbia was intentionally drawn to make war inevitable, and, until Serbia had been punished, no proposals for mediation would be listened to. "This country has gone wild with joy at the prospect of war with Serbia, and its postponement or prevention would undoubtedly be a great disappointment. "I propose, subject to any special directions you desire to send me, to express to the Austrian Minister for Foreign Affairs the hope of his majesty's Government that it may yet be possible to avoid war, and to ask his excellency whether he cannot suggest a way out even now." 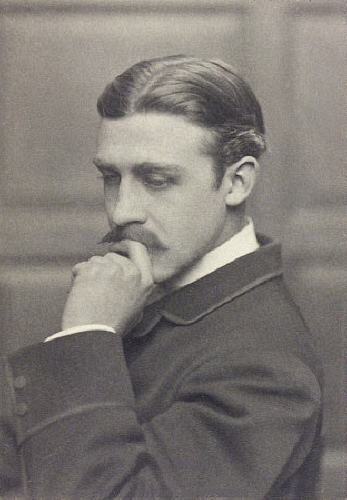 Sir Francis Bertie, Ambassador at Paris, telegraphed to Grey that France had accepted his proposal for the four-power mediation, and sent the necessary instructions to her representatives at Belgrade, Vienna, and St. Petersburg. "Instructions have been sent to the French Ambassador at Berlin to concert with his British colleague as to the advisability of their speaking jointly to the German Government. Until it is known that the Germans have spoken at Vienna with some success, it would, in the opinion of the Ministry of Foreign Affairs, be dangerous for the French, Russian, and British Ambassadors to do so." "Secretary of State [Von Jagow] says that conference you suggest would practically amount to a court of arbitration and could not, in his opinion, be called together except at the request of Austria and Russia. He could not therefore fall in with your suggestion, desirous though he was to cooperate for the maintenance of peace. I said I was sure that your idea had nothing to do with arbitration, but meant that representatives of the four nations not directly interested should discuss and suggest means for avoiding a dangerous situation. He maintained, however, that such a conference as you proposed was not practicable. He added that news he had just received from St. Petersburg showed that there was an intention on the part of M. de Sazonof [Russian Minister for Foreign Affairs] to exchange views with Count Berchtold [Austro-Hungarian Minister for Foreign Affairs]. He thought that this method of procedure might lead to a satisfactory result, and that it would be best, before doing anything else, to await outcome of the exchange of views between the Austrian and Russian Governments. "In the course of a short conversation Secretary of State said that as yet Austria was only partially mobilizing, but that if Russia mobilized against Germany latter would have to follow suit. I asked him what he meant by 'mobilizing against Germany.' He said that if Russia only mobilized in south, Germany would not mobilize, but if she mobilized in north, Germany would have to do so too, and Russian system of mobilization was so complicated that it might be difficult exactly to locate her mobilization. Germany would therefore have to be very careful not to be taken by surprise. "Finally, Secretary of State said that news from St. Petersburg had caused him to take more hopeful view of the general situation." 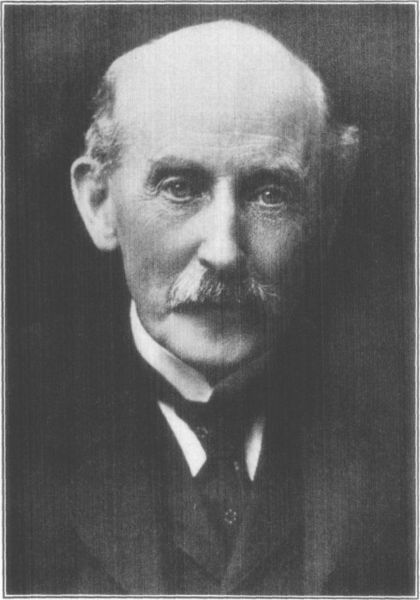 Sir George Buchanan, Ambassador at St. Petersburg, telegraphed Grey an account of the interview between M. Sazonof, Russian Minister for Foreign Affairs, and Count Szápáry, the Austro-Hungarian Ambassador, in which Sazonof had pointed out that Austria's demands entailed entire revision of existing Serbian laws, and were moreover incompatible with Serbia's dignity as an independent state; and that it would be useless for Russia, being an object of suspicion in Austria, to offer her good offices. "In order, however, to put an end to the present tension, he thought that England and Italy might be willing to collaborate with Austria." 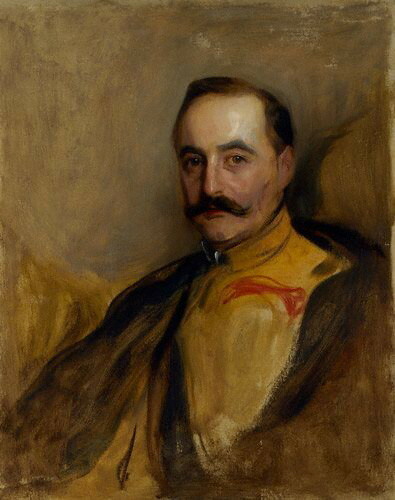 Sir George told M. Sazonof that Grey could do nothing more than he had promised on the 24th inst., and that the Russian Minister was mistaken if he believed that peace would be promoted by Great Britain telling Germany it would have to deal with her as well as with Russia and France if it supported Austria by force of arms. "Their attitude would merely be stiffened by such a menace, and we could only induce Germany to use her influence at Vienna to avert war by approaching her in the capacity of a friend who was anxious to preserve peace. His excellency must not, if our efforts were to be successful, do anything to precipitate a conflict. I trusted that the Russian Government would defer mobilization ukase for as long as possible, and that troops would not be allowed to cross the frontier even when it was issued. "The Minister for Foreign Affairs replied that, until the issue of the imperial ukase, no effective steps toward mobilization could be taken, and the Austro-Hungarian Government would profit by delay in order to complete her military preparations if it were deferred too long." "that the modifications to be introduced into Austrian demands should be the subject of direct conversation between Vienna and St. Petersburg." 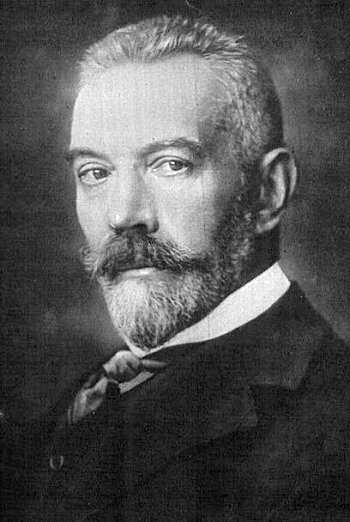 Grey telegraphed to Sir Eward Goschen, British Ambassador at Berlin, that Prince Lichnowsky, the German Ambassador at London, had informed him that Germany accepted in principle the four-power mediation, reserving its right as ally to help Austria if attacked. "He has also been instructed to request me to use influence in St. Petersburg to localize the war and to keep up the peace of Europe. "I have replied that the Serbian reply went further than could have been expected to meet the Austrian demands. German Secretary of State [Von Jagow] has himself said that there were some things in the Austrian note that Serbia could hardly be expected to accept. I assumed that Serbian reply could not have gone as far as it did unless Russia had exercised conciliatory influence at Belgrade, and it was really at Vienna that moderating influence was now required. If Austria put the Serbian reply aside as being worth nothing and marched into Serbia, it meant that she was determined to crush Serbia at all costs, being reckless of the consequences that might be involved. Serbian reply should at least be treated as a basis for discussion and pause. I said German Government should urge this at Vienna. "I recalled what German Government had said as to the gravity of the situation if the war could not be localized, and observed that if Germany assisted Austria against Russia it would be because, without any reference to the merits of the dispute, Germany could not afford to see Austria crushed. Just so other issues might be raised that would supersede the dispute between Austria and Serbia, and would bring other powers in, and the war would be the biggest ever known; but as long as Germany would work to keep the peace I would keep closely in touch. I repeated that after the Serbian reply it was at Vienna that some moderation must be urged." Grey telegraphed Buchanan at St. Petersburg, referring him to the above, and informing him that the Russian Ambassador at London, Count Benckendorff had told him [Grey] that the impression prevailed in German and Austrian circles that Great Britain would stand aside in event of war. This the Ambassador deplored for its adverse effect on peace. 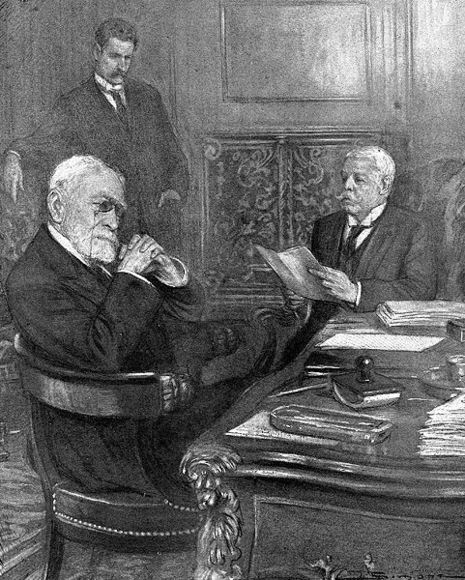 Grey informed Sir Maurice de Bunsen, British Ambassador at Vienna, of his interview just held with Count Mensdorff, Austro-Hungarian Ambassador at London. "Mensdorff said that the Austrian Government, very reluctantly and against their wish, were compelled to take more severe measures to enforce a fundamental change of the attitude of enmity pursued up to now by Serbia.... We would understand that the Austrian Government must consider that the moment had arrived to obtain, by means of the strongest pressure, guaranties for the definite suppression of the Serbian aspirations and for the security of peace and order on the southeastern frontier of Austria. "As the peaceable means to this effect were exhausted, the Austrian Government must at last appeal to force. Their action, which had no sort of aggressive tendency, could not be represented otherwise than as self-defense. Also they thought that they would serve a European interest if they prevented Serbia from being henceforth an element of general unrest such as she had been for the last ten years. The high sense of justice of the British nation and of British statesmen could not blame the Austrian Government if the latter defended by the sword what was theirs, and cleared up their position with a country whose hostile policy had forced upon them for years measures so costly as to have gravely injured Austrian national prosperity. Finally, the Austrian Government, confiding in their amicable relations with us, felt that they could count on our sympathy in a fight that was forced on them, and on our assistance in localizing the fight, if necessary. "Count Mensdorff added on his own account that, as long as Serbia was confronted with Turkey, Austria never took very severe measures because of her adherence to the policy of the free development of the Balkan States. Now that Serbia had doubled her territory and population without any Austrian interference, the repression of Serbian subversive aims was a matter of self-defense and self-preservation on Austria's part. He reiterated that Austria had no intention of taking Serbian territory or aggressive designs against Serbian territory. "I said that I could not understand the construction put by the Austrian Government upon the Serbian reply, and I told Count Mensdorff the substance of the conversation that I had had with the German Ambassador this morning about that reply. "Count Mensdorff admitted that, on paper, the Serbian reply might seem to be satisfactory; but the Serbians had refused the one thing—the cooperation of Austrian officials and police—which would be a real guaranty that in practice the Serbians would not carry on their subversive campaign against Austria. "I said that it seemed to me as if the Austrian Government believed that, even after the Serbian reply, they could make war upon Serbia anyhow, without risk of bringing Russia into the dispute. If they could make war on Serbia and at the same time satisfy Russia, well and good; but, if not, the consequences would be incalculable. I pointed out to him that I quoted this phrase from an expression of the views of the German Government. I feared that it would be expected in St. Petersburg that the Serbian reply would diminish the tension, and now, when Russia found that there was increased tension, the situation would become increasingly serious. Already the effect on Europe was one of anxiety. I pointed out [as an instance of this] that our fleet was to have dispersed to-day, but we had felt unable to let it disperse. We should not think of calling up reserves at this moment, and there was no menace in what we had done about our fleet; but, owing to the possibility of a European conflagration, it was impossible for us to disperse our forces at this moment. It seemed to me that the Serbian reply already involved the greatest humiliation to Serbia that I had ever seen a country undergo, and it was disappointing to me that the reply was treated by the Austrian Government as if it were as unsatisfactory as a blank negative." Grey informed Sir Rennell Rodd, British Ambassador at Rome, that the Italian Ambassador at London had stated to Sir Arthur Nicholson, Under-Secretary for Foreign Affairs, that Italy agreed to the four-power conference, and that the Marquis di San Giuliano, Italian Minister for Foreign Affairs, would recommend to Germany the suggestion that Russia, Austria-Hungary, and Serbia should suspend military operations pending result of the conference, and would inquire what procedure Germany proposed to be followed at Vienna. Sir Francis Bertie, Ambassador at Paris, sent Grey a memorandum of M. Bienvenu-Martin's, French Acting Minister for Foreign Affairs, as to steps to be taken to prevent hostilities between Austria-Hungary and Serbia. M. Jules Cambon, French Ambassador at Berlin, has been requested to act in concert with the British Ambassador there in Grey's plan. M. Paul Cambon, Ambassador at London, has been appointed France's representative in the four-power conference. France is ready to instruct her representatives at St. Petersburg, Vienna, and Belgrade to induce these governments to abstain from hostilities pending the results of the conference. But M. Bienvenu-Martin considers success of the conference depends on the action Berlin is willing to take at Vienna beforehand. Sir George Buchanan, Ambassador at St. Petersburg, telegraphed to Grey an account of an interview just had with M. Sazonof, Minister for Foreign Affairs. Sazonof was conciliatory and optimistic. "Sazonof said he was perfectly ready to stand aside if the powers accepted the proposal for a conference, but he trusted that you would keep in touch with the Russian Ambassador in the event of its taking place." France. M. Farges, Consul General at Basle, Switzerland, reported to M. Bienvenu-Martin, Acting Minister for Foreign Affairs at Paris, that German officers on leave in this district had been ordered to return to Germany, and that owners of motor cars in Baden had been ordered to be ready to place them at the disposal of the Government, and secrecy enjoined as to the order under penalty of fine. People at Basle are uneasy, and banking facilities restricted. M. de Fleuriau, Chargé d'Affaires at London, reported to M. Bienvenu-Martin that the German and Austrian Ambassadors there were letting it appear that they were sure Great Britain would preserve neutrality in case of war. Sir Arthur Nicholson, Under-Secretary for Foreign Affairs, had, however, assured Prince Lichnowsky, the German Ambassador, that Great Britain was free to intervene if she judged it expedient. To make this understood in Germany, nevertheless, that Government should be made to know for certain that they will find Great Britain by the side of France and Russia. M. Paléologue, Ambassador at St. Petersburg, telegraphed that M. Sazonof, Minister for Foreign Affairs, was using conciliatory language to the ambassadors, and was restraining the press, particularly in recommending great moderation toward Germany. M. Bompard, Ambassador at Constantinople, telegraphed from Therapia that the Turks were delighted at the misfortunes of Serbia, and thought that Russia will not intervene in her favor under circumstances which would extend the war beyond Serbia and Austria. "The unanimous feeling in Ottoman political circles is that Austria, with the support of Germany, will attain her objects, and that she will make Serbia follow Bulgaria and enter into the orbit of the Triple Alliance." M. de Fleuriau, Chargé d'Affaires at London, reported the interview between Sir Edward Grey, Secretary of Foreign Affairs, and Prince Lichnowsky, German Ambassador. "The attitude of Great Britain is confirmed by the postponement of the demobilization of the fleet. The First Lord of the Admiralty [Winston Churchill] took this measure quietly on Friday on his own initiative; to-night Sir Edward Grey and his colleagues decided to make it public. This result is due to the conciliatory attitude of Serbia and Russia." M. de Fleuriau, Chargé d'Affaires at London, reported news from St. Petersburg of the willingness of Russia to stand aside if Serbia appealed to the powers. Accordingly Sir Edward Grey will proceed with his plan of a conference, on the understanding that, pending its results, Russia, Austria, and Serbia abstain from active military operations. To this the German Ambassador, Prince Lichnowsky is favorably disposed. Later M. de Fleuriau reported that the Serbian Minister at London, M. Boschkovitch, had not yet received instructions to ask for British mediation. Possibly telegrams to that effect had been stopped on the way. M. Bienvenu-Martin having received Sir Edward Grey's proposal for the four-power conference, authorized M. de Fleuriau to represent France in it. He repeated his conviction of failure of the conference unless Germany's influence were first exercised pacifically at Vienna. "I have also noted, during Baron von Schoen's observations, that the Austro-Hungarian Government was particularly susceptible when the words 'mediation,' 'intervention,' 'conference' were used, and was more willing to admit 'friendly advice' and 'conversations.'" De Fleuriau reported that Italy had accepted intervention by the powers to prevent military operations. Germany had not yet replied to Italy's request for information as to procedure to be followed with regard to Austria-Hungary. M. Barrère, Ambassador at Rome, reported his interview with the Marquis di San Giuliano, in which that Minister for Foreign Affairs had repudiated his reported approval of the action of Austria-Hungary. "He is convinced that Austria will not withdraw any of her claims, and will maintain them, even at the risk of bringing about a general conflagration; he doubts whether Germany is disposed to lend herself to any pressure on her ally. He asserts, however, that Germany at this moment attaches great importance to her relations with London, and he believes that if any power can determine Berlin in favor of peaceful action, it is England. "As for Italy she will continue to make every effort in favor of peace. It is with this end in view that he had adhered without hesitation to Sir Edward Grey's proposal for a meeting in London of the ambassadors of those powers which are not directly interested in the Austro-Serbian dispute." M. Jules Cambon, Ambassador at Berlin, reported the interview of Sir Edward Goschen, the British Ambassador, with the German Secretary of State, and said that Herr von Jagow's language confirmed that of Baron von Schoen at Paris. M. Bienvenu-Martin then notified the French Ambassadors at London, St. Petersburg, Berlin, Vienna, and Rome, of his interview with Count Szécsen, the Austro-Hungarian Ambassador, and the memorandum he had submitted criticizing the Serbian reply to the Austrian note. Belgium. Baron Beyens, Minister at Berlin, reported to M. Davignon, Minister for Foreign Affairs at Brussels, the diplomatic situation at the German capital. Germany had not replied to the British proposal. "The decision rests with the emperor." Wilhelm Eduard Freiherr von Schoen (June 3, 1851 Worms - April 24, 1933 Berchtesgaden) was a German diplomat. He was especially know as German ambassador in Paris at the beginning of World War I and as State Secretary for Foreign Affairs of the German Empire.